Hello and welcome to our new website. We hope you find the site informative and user friendly and that you will use it often. The Wellsville Fire Co., like a majority of the fire companies in Pennsylvania, is a Volunteer organization. We are blessed with a fine group of well trained volunteers who handle our emergency calls and a very dedicated and supportive auxiliary group. We are also extremely proud of the community volunteers who assist us in our various events to raise funds throughout the year. Those community volunteers are actually the back bone of the company because without them our active volunteers would not be able to respond to calls and also do all the extra work that these volunteers provide. Thanks for your support! We also receive support from our surrounding municipalities and have a very good working relationship with them. We are always looking for those in the community that would like to get more active in either responding to emergency calls or with the auxiliary. 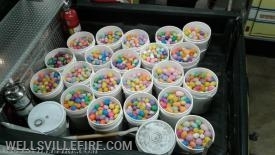 The emergency call area would include fire, EMS (first aid) or fire police. The auxiliary provides support for the emergency personnel on large incidents and they also serve banquets and handle the preparation and serving of food at our events. If you are interested in becoming active in any of these areas please call 432-5428 and leave a message. Remember, we are volunteers so if you don't get a response from your message, please call back. We are citizens of the community just like you. We pay taxes and certainly don't want them to increase. This is a vital service to the community and relies, other than some support from the municipalities, on our fund raisers and donations from the community. We don't even want to think about what this service would cost the tax payer if it were a paid service! Volunteers in a lot of organizations help control expenses in our municipalities and need our support. The men and women of this organization who are there for you 24 hours a day are dedicated and well trained. Your support in assisting with events and/or making a donation allows the company to pay for training, upkeep for the building and grounds and to maintain vehicles and equipment. A great deal of the training is required by law and takes a great deal of time on a yearly basis for the active members. Check the Website, the newspaper and posters for our events and come out and support us. We have a very nice carnival the 3rd weekend in August and hope to see you there. Members of the Wellsville Fire Co.
We are excited to team up with Hoss's Steak and Sea House again to raise money for a very worthy cause. Please consider visiting the Hoss's location listed below on 3/23/2019 to aid us in raising money to benefit Wellsville Fire Department. Wellsville Fire Company is trying a new fundraiser event. 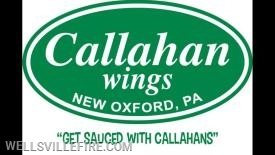 AYCE Wing Night by Callahans Wings on Saturday, April 6, 2019, 4:30 pm to 8:00 pm. Menu includes wings, hot dogs, french fries & beverages - NO CARRYOUTS. Tickets are $20 donation and MUST be purchased in advance, no tickets sold at the door. MUST be 21 to enter, ID required. Tickets are $20 each, must be 21. There are 24 prizes on the main raffle, if you're not interested in the gun, there is a cash option. Small games of chance will be available during the evening. The meal is included in ticket purchase and is pulled pork or beef sandwich, macaroni and cheese, coleslaw, and baked beans. The meal is served at 5:00 pm. Soda, water, coffee and snacks provided.